I think this quote summarizes wonderfully the difference between love and anger. Usually, people who feel threatened in some way react with anger. It’s worth keeping that in mind. There’s a lot of value in what he says here, although I don’t fully agree with it. A good life has goals, yes, but it also has people and things that you love and care about. Achieving a goal is a wonderful thing, but having great people in your life is also powerful. This is a great talk about using your fears to improve yourself. I’ve found that most of the profound things in my life have come about at least in part as a result of overcoming some fear of mine. We all look to the future with great hope in our eyes. The trick is to not get blinded by that vision of hope. Whenever I get a sense in my head that things are steady and unchanging, all I need to do is look at an old map. This is what the United States looked like about 150 years ago. Shortly after this map was drawn, the United States split itself in half for a while. It reformed and grew again. Things are always changing. The seeds of a much different tomorrow are being planted right now. We often don’t know what the view from the mountaintop will be while we’re climbing it. Sometimes, the view isn’t what we hoped it to be. The best journey is the one where the enjoyment comes from getting there. While the human world may change rapidly, some elements of the natural world scarcely change at all. 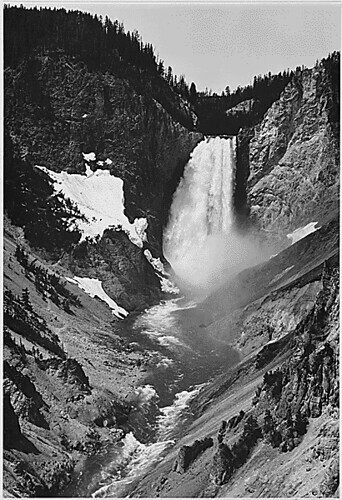 Yellowstone is as breathtaking now as it was then. It’s a wonder we can share with our ancestors and our descendents. I try to hold to this when we’re playing board games or card games. So often, you win by scooping up the mistakes other players make. The trick is to do it politely. This is easily my favorite solo song by John Lennon. I like this video, too, because of the visual of the spinning vinyl record. Politics can be very frustrating. It can make you feel sick to your stomach at times. It can make you very upset at other times. Still, we lose as a people when we take our eye off the ball. Every day, you should strive to deeply understand what it is you believe and stand for and how you can connect that to the people involved in public policy.